Believe it or not, in the fashion industry any woman size 8 or above is considered plus-sized. And, unfortunately, plus-sized women are often forgotten when designers are making their creations for ladies. So it was a welcome surprise when I found out that they were not forgotten at Fashion’s Night Out, the kick-off for NYC’s Fashion Week. 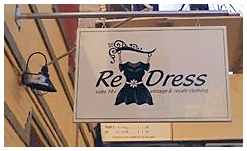 Brooklyn’s Re/Dress NYC, a vintage and thrift store that caters to plus-size women, joined forces with Lotis Clothing to celebrate fashion for these oft-neglected lovely ladies. In addition to being fabulous, the gathering had another mission: to send the message to designers that plus-size women matter too! Amen! As a woman who fits into the fashion’s definition of “plus-size,” I can’t wait to visit Re/Dress NYC with some of my girls very soon!